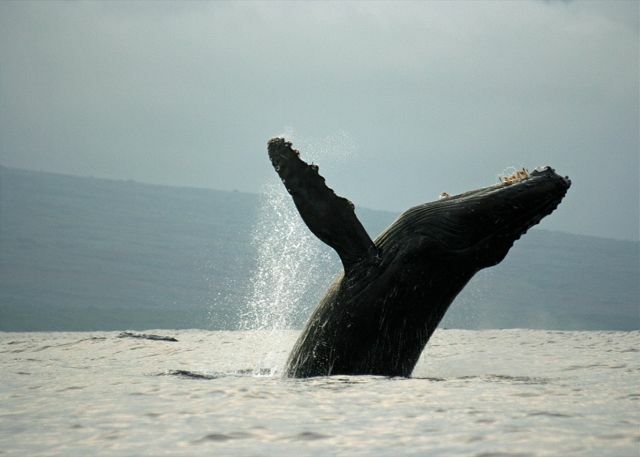 Humpback whales, up and out, DEC to MAR, amazing! Experience a world of limitless adventure and sun-filled days in Hawaii. Once you step through our front door, you will be swept away by Maui’s timeless charm. Our ground floor condo is situated just paces from the Pacific Ocean. 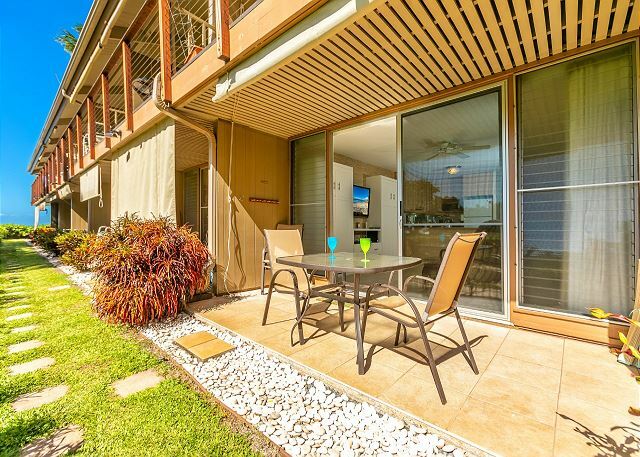 Listen to sounds of the surf, watch breathtaking sunsets or simply let time pass while relaxing on our lanai. 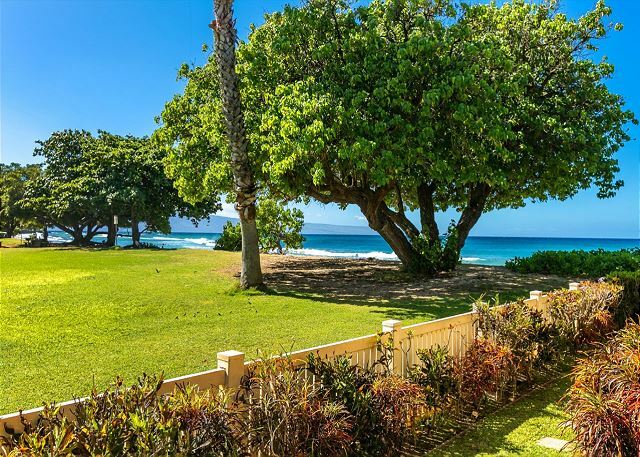 Swim in the oceanfront pool or lay back on the pool deck in a chaise lounge with uninterrupted ocean views of Lanai’i and Moloka’i. Snorkel along the coral reef or enjoy an oceanfront BBQ. Sea turtles forage all year, the occasional spinner dolphins and humpback whales are regular sightings during their migration. 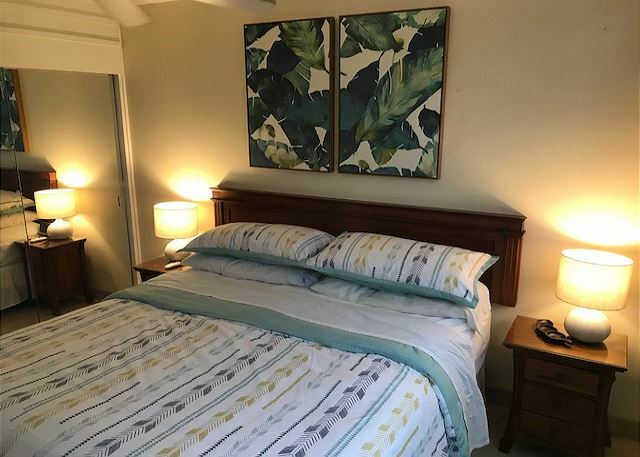 Our condo is tastefully decorated with island inspired artwork, Hawaiian furnishings and is equipped with energy efficient appliances. 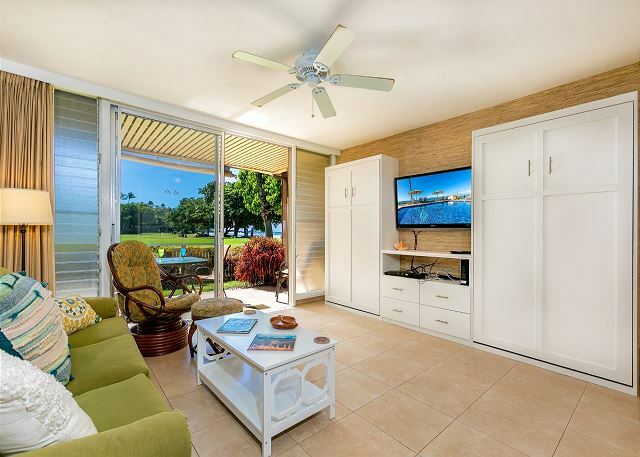 Feel the cool porcelain tiles underfoot and enjoy the breezy trade winds flowing through louvered windows, after returning from experiencing the beautiful Hawaiian outdoors. 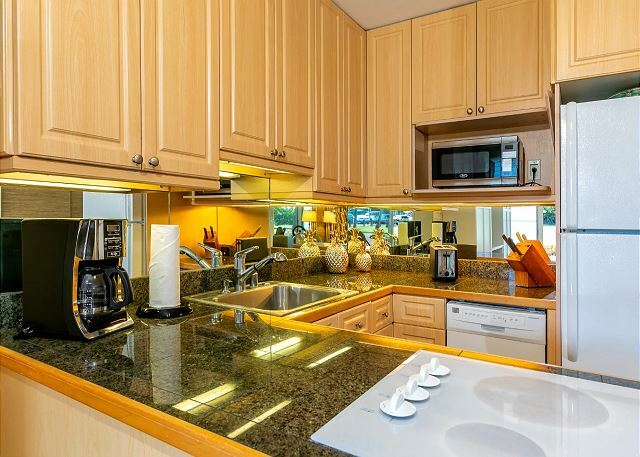 Our well appointed kitchen includes custom cabinets, granite countertops, modern appliances and is fully equipped for those who wish to practice their culinary skills. Sample the freshest island cuisine with so many wonderful places to dine nearby. Dine inside or out, while relaxing on our covered lanai and take in the views. Behold the magnificence and beauty of each sunset as the day transcends into night. Enjoy our living room with a 46” Sony LCD Flat Screen TV, Blu-Ray Disc Player, iPhone/iPod stereo with radio/CD and free wireless internet. Beautiful tropical furnishings and decorator touches create a truly restful experience. The bedroom features a Cal King-Sized bed, blackout curtains, beautiful teak furniture and island style artwork. This peaceful environment is further enhanced by the sound of the ocean lulling you to sleep at night. 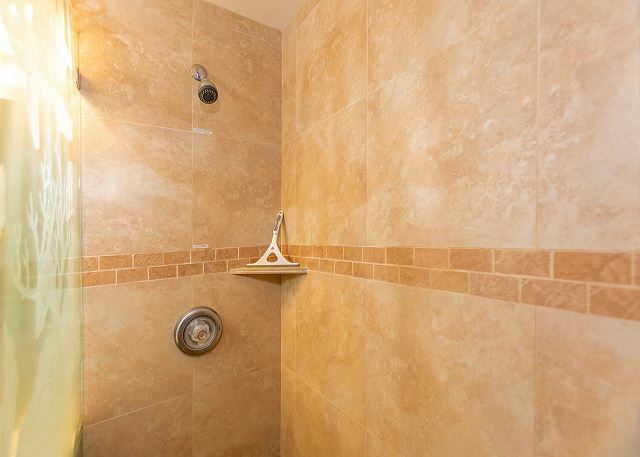 Our bathroom includes a walk-in shower, highlighted by a glass screen, featuring a sea turtle etching created by upcountry artist Don Crossley. A single sink vanity cabinet, two medicine cabinets and quality Kohler fittings. 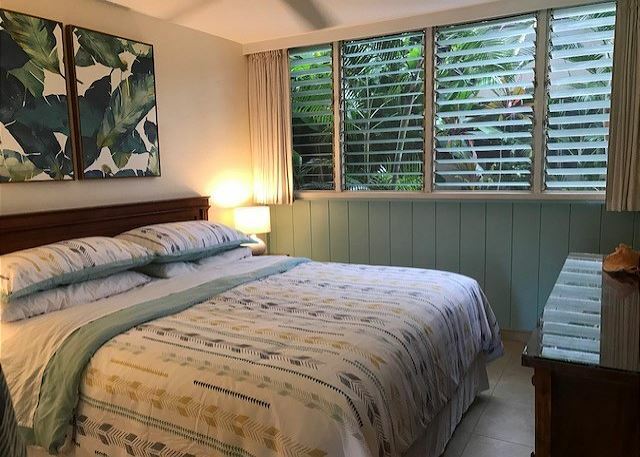 Escape to a distinctly memorable tropical getaway, with captivating island culture, Hale Kai #107 - Your 'Home by the Sea' for a stimulating romantic escape, you have come to the right place! 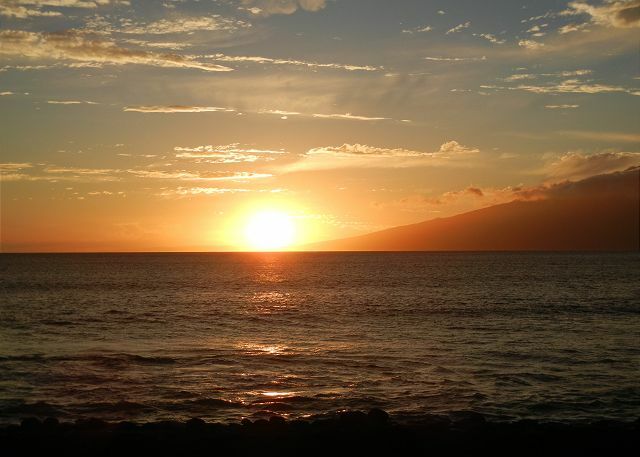 Our condo is 5 minutes north of Ka’anapali and within a 15 minutes drive, to most West Maui attractions. A short stroll to Honokowai Farmer’s Market, organic food store, local coffee shop and a comfortable walk to numerous restaurants and shops nearby. Rates for this unit are based on two occupants, and vary depending on season, length of stay, and whether booked at the last moment. Please specify your desired dates and number of occupants on the "Rates & Availability" tab to obtain a quote for your specific circumstances. My wife and I had a great time. Nice setup (would suggest providing beach chairs), Conveniently situated. From the pool area, we could even look away for humpback whales breaching and, from our patio, watch the beautiful sunset. Cute little place. It is really close to the ocean and walkable to a great coffee place and farmers market. There were a couple of bugs as you might expect with the open air style, but not in a problematic way. Everything was clean and peaceful. This was our sixth stay over the past thirty years. Once again it was wonderful I n spite of cool, windy weather. Valerie was very helpful as always. We found a few small cockroaches and the problem was immediately addressed. a guest from Abbotsford, BC does not recommend this vacation rental. Hale Kai is an awesome complex – we are repeat guests stayed twice in 108, a few times in 107 and once in 113. 107 was always our favorite. The décor was amazing and made you feel as if you were in the tropics. Something has changed. When entering the unit this huge WHITE cabinet in the living room (murphy beds) grabs you. Gone are the beautiful pineapple tables. In their place are a cheap white coffee table and a cheap end table. Someone has covered the tropical fabric on the dining chairs with this bluish colored fabric – does not say tropical. 107 had two beautiful mirrors in it too, with lovely stained wood – well that’s all been painted white now. The kitchen has not changed much – still the same appliances, etc. Garburator doesn’t work and good luck finding any containers or large cheap plastic bowls – they are all gone now, as is the cutting board. There is a select assortment of spices in the cupboard as well as necessary utensils and cups. The lovely etched glass for the shower is still there. Chairs from the dining area are crammed into the bedroom. Cleanliness of the unit – BAD. This was reported on the check in slip - I was promised that someone would come by to clean, however nobody had showed up. Our feet were black after the 1st day. Wiping a wet paper towel to the kitchen floor to clean it, and it was black when done. The ceiling fans would appear that they haven’t been cleaning in months, as well with the bathroom fan. BUGS! The kitchen had to be the worst! Ranging from cockroaches to ants and beetles and termites. I am not talking about the odd one – they were everywhere – coming out of the cupboards/cabinets. I told this to the front desk and was promised it would be looked at – nobody showed up. A unit should be clean and smell clean when a guest arrives. easy check in and very clean. note there is no AC but the shutter system does help a lot with a great breeze and hearing the ocean made for an incredible sleep. The quality of the condo is really high. It is nice, clean, all amenities are great, no desires were left. The swimming pool is near, clean and with a great oceanview. The place was beautiful with a view of the park and water. There was a grocery store within walking distance and a fish market with awesome food. We also saw multiple TURTLES!! Overall, very pleased with the accommodations, the services at the facility and the helpfulness of the staff. The location was excellent as well, close to lots of activities and sights. Wonderful, relaxing, great location, nice pool, OK beach. We really enjoyed our stay in Kauai and the condo unit we had at Hale Kai - #107 was wonderful. Everything you need is there including spices, bowls, pans, cooking utensil, Barbecues and even binoculars! The only thing missing was lawn chairs but we were able to borrow some from laundry room. It was quaint, clean easy access to the beach. Great view of turtles and whales from shore. The pool was wonderful. We'll definitely come back and either choose this room or 1 or 2 others that we've now viewed. Staff is very friendly too. A great week in paradise. Experience at Hale Kai was very much as expected/hoped. Resort is a smaller/boutique which is a nice change from all the larger chain resorts in the area. The manager (Valarie) couldn't have been nicer or more accommodating. Sat by the pool and watched whales breaching every evening at sunset. Sea turtles and snorkeling right off the beach in front of the property. Spectacular. Unit #107 was clean, and extremely well appointed. Absolutely everything was providing (including a cooler for the beach). Units are older and a bit noisy at times, but never it quiets down early in the evening. Overall, a great experience and will be happy to return. Condo was clean, cute perfect for two. Location was great with park and beach. Would definitely go back! Wonderful experience. We loved our condo. Close to many local shops. The next door city park provided a good local feel and people watching. Beautiful ocean views and swimming/snorkeling right off the front beach. Valarie the resident manager was great. She helped with anything we needed to make our experience the best it could be. I highly recommend spending time at the Hale Kai. Great stay at the Hale Kai as usual!! #107 has updated kitchen, everything worked great. #107 is close to the parking lot but we didn't notice extra noise. Nice cross breeze at night with the slatted windows. Valerie was helpful in the front office, arranged so we could stay a little longer the last day, which we were not expecting. The lanai has great view of the park & ocean, so convenient. Love the Farmer's Mkt across the street (M,W,F mornings), & the store is open all the time. Got great fish from Fish Mkt couple blocks away, used BBQ by the pool. Easy access to so many great beaches. Boss Frog's for snorkeling equip across the street. 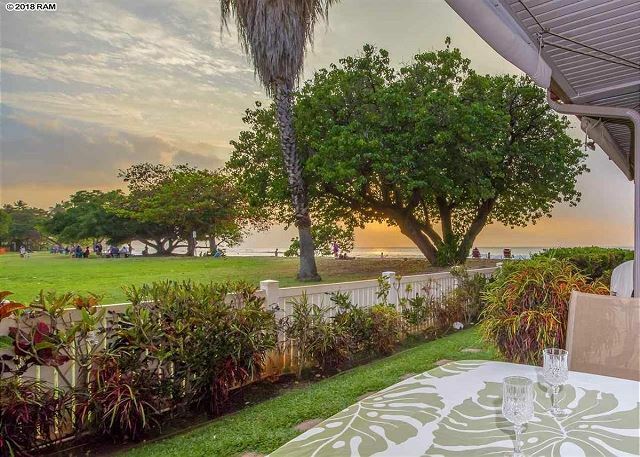 Short drive into Lahaina, as needed, but location of Hale Kai is perfect for going everywhere. Used the pool every day, so lovely to have access right off the ocean (after rinsing off, of course.) Having laundry room & recycling & library all by the front office was awesome! Feels like home away from home! My adult daughter and I had a blast. Never touched the tv for 2 weeks. Just ate, drank, snorkeled, swam, slept, people watched, hiked, drove, talked, relaxed. We did have some very loud neighbors that had their tv blasting late into the night but you can't pick your neighbors. I just put on wave sounds on my iPad and was fine. The unit was clean and nice. We had the best view of fireworks on the island. Right outside the living room. A 2 minute walk to coffee and bagels. Wonderful & peaceful. The 1st several times that I stayed at the Hale Kai, I was a little girl vacationing with my family. Now I am old enough to have a grand daughter the same age as I was when I stayed there, and the property is just as nice as it was all those years ago! LOVED IT, and the amazing time we had with my family! 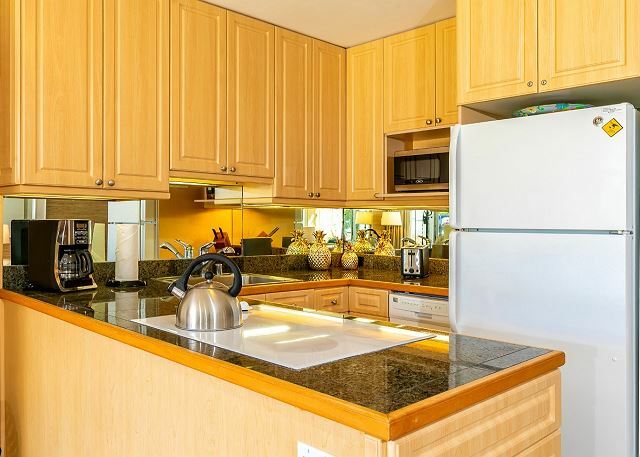 Wonderful oceanfront condo with a very friendly owner! This condo was fantastic! The pictures are accurate. It is very clean and you have everything you need there to cook. The ocean views are dreamy. The people that own there are very friendly too. We met the owner and he is a very nice guy and really cares about his rental and renters. The location is perfect with so much to do close by. We would definitely rent this unit again. CHERYL S from San Bruno, CA does not recommend this vacation rental. Property was beautiful and clean. Great location to the parks and small beach. Office staff was professional and friendly. I must say, our neighbors were horrible there's was a man living on a monthly rental next door that blasted his stereo, laughed at us each time we walked to the beach. and our other neighbor let their kids walk in our patio, kids were screaming most of time, while the women did her yoga in front of our unit each morning. I'm born and raised on Oahu, guess I'm more used to the Aloha hospitality instead of "your just a renter, and you'll be gone soon" Loved the unit, not sure if I would return. Incredible location just steps from the beach. Condo was stocked with just about everything you can think of which made it very easy come dinner time when we wanted to cook. Having spices, oils and sauces all there ready to use was a real treat. Bed is super comfortable. Pool is also a nice bonus for those times you don't want to swim in the beach. Caren at check in was exceptional such great customer service. Would happily stay here again it is such a great place and couldn't ask to be closer to the beautiful water of Maui. We had an amazing experience staying at this condo for our honeymoon. The condo was very clean, organized and had all of the kitchen supplies we needed. The location was nice and had a small beach just outside the window (not great for swimming but there were a lot of sea turtles). 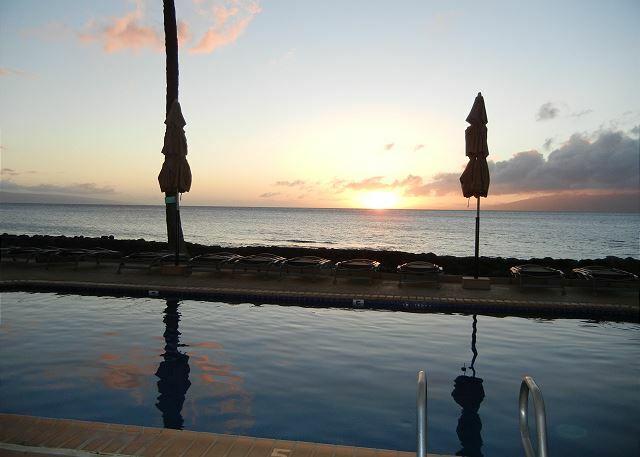 Great access to town and only a short drive to Ka'anapali Beach. We highly recommend this condo! We had an amazing vacation in Maui! The rental was exactly what we were expecting based on the description and pictures. Highly recommend! We had an amazing time in paradise. our unit was clean and comfortable. great location on the beach. microwave was pretty dated and front door/lock box were difficult(sticky)but everything else was awesome!!! The ocean lulling you to sleep at night and the ocean encouraging you to get up and play in the doesn't get any better than that! Beautiful Condo! 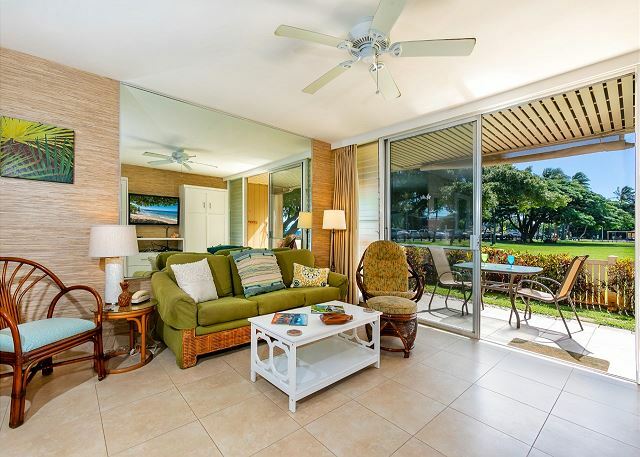 Spent time every morning and every night on our lanai facing a park with the ocean to the right. Great view, great location fabulous condo! We walked to the market, to several restaurants and to the store. This will have been our 4th time at Hale Kai - the first time in #107. This unit is exceptional. Very well updated and clean. We love the park side of the property as it gives us a buffer and we can still see (and hear) the ocean. Valerie is great in the office. The other person is a little aloof. The owner of the unit happened to be present for the first few days, and it was a pleasure to meet him. Very accommodating. Honestly, we didn't find anything wrong with the unit or property during our stay. In fact we have booked (2 days in) for next year! I think other owners should look at what #107 has done, and how the owner takes pride in their rental unit - it shows. While this was one of the wettest times we have been on Maui, it does not lower our view of the property. The only comment I have is with respect to the cutting of the Palm Trees (has nothing to do with the unit) - we were told to have our cars moved between 7:30am and 4pm, however there was no alternative provided for parking. See you next year (or sooner)! This is our second stay at this condo #107. We felt really comfortable the first time, we decided to come back. Having a pool, bbq and beachfront ocean view within the property, not only is rare, but very convenient. If we were too lazy to explore the island, we had paradise outside our door. The property management takes great pride in the individual units and the propriety itself. They were always very responses to our questions, and always helpful. The best part about 107, is the lenai faces a family park and ocean. It was wonderful to see the local family gatherings and activities. It was never too loud, or full, just small intimate gatherings of families. It is a very safe environment. Unit 107 is spotless and has everything you need for a vacation stay - right down to the clothes pins! Thank you so much, we look forward to returning next year. This is what I imagined when I pictured my visit to Maui! I found it surprisingly difficult to find a first floor condo that was part of a smaller complex, but still right on the beach. Hale Kai had all of those things! The staff were extremely welcoming and the complex was well kept. Even better, we were not even 50 steps from sand! While we spent most of our days traveling around the island, it was nice to come back to the beach out front to watch the sunset every night. 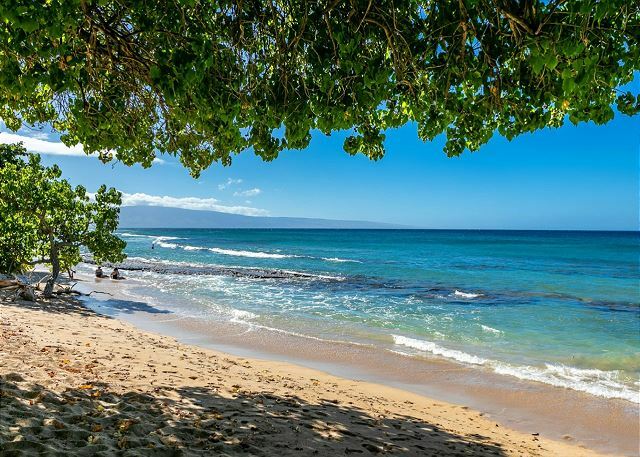 There are plenty of places to check out around the area, and then most other places on the island are about one hour's drive (like South Maui or Central Maui). I would definitely recommend staying here! What a pleasure it was to stay at the Hale Kai #107 condo for our stay on Maui! A beautiful, comfortable, well appointed condo that took care of our every need. 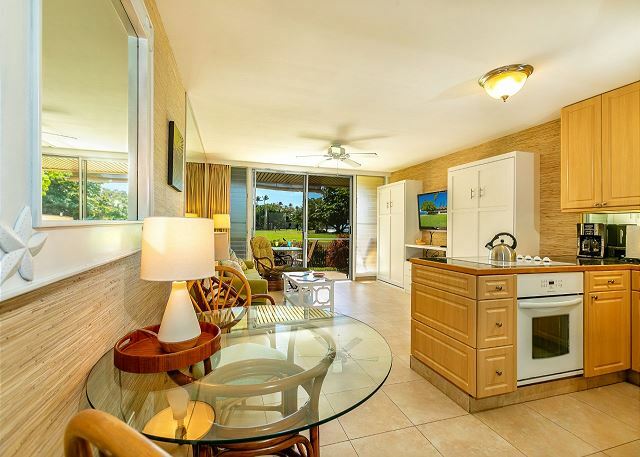 The view was beautiful, the condo immaculate with fresh, clean linens, a kitchen with full-sized appliances and all necessary cook/serve ware, comfortable king-sized bed, and friendly, welcoming staff. 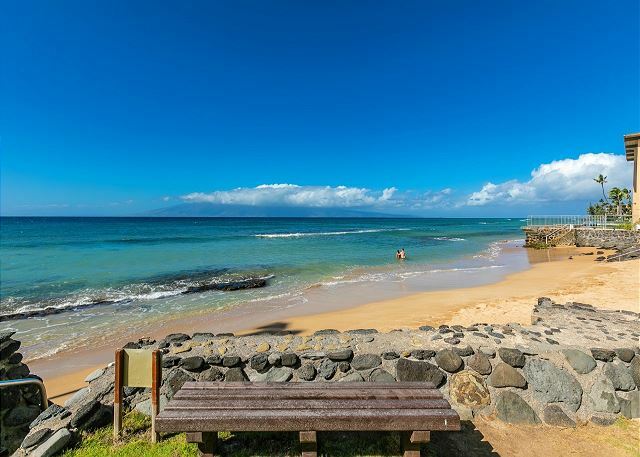 The ocean was steps away from the lanai and we found that the neighboring family park added to the overall pleasure of our stay. The property is very well maintained and the views from the pool and grill areas are stunning. 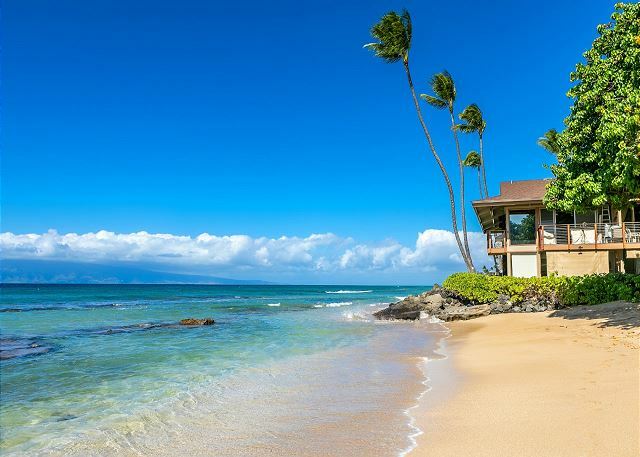 We would definitely stay at the Hale Kai #107 for any future visits to Maui. 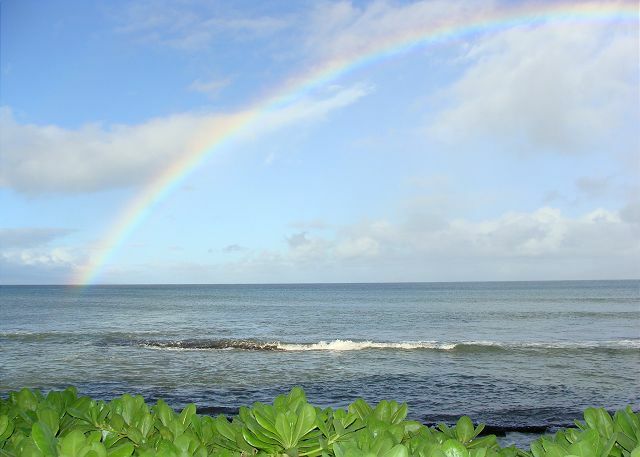 Hale Kai is truly your Home by the Sea. It was so relaxing, we enjoyed being in our "home" almost as much as sitting by the ocean. We never felt a huge desire to go other places as we were so happy right where we were at. The condo is decorated beautifully, light and airy with beautiful accents. I also loved the view of the adjoining park and the activities. We were not disappointed with any aspect of our choice and look forward to returning. Mahalo. The Hale Kai is a wonderful Hawaii experience and unit 107 was perfect for us. It has an ocean view but faces the park which I actually preferred. The trade winds gently blew through our unit at all times. The unit has a music player for your phone so you don't need to bring one. It also has a blender for island smoothies. And the walk in shower was a classy touch. The bed was extremely comfortable and I loved the huge, fluffy pillows. We slept like babies. The other Hale Kai guests are friendly and approachable, and ever sunset they gather by the pool for the conch blow. The whales put on two fabulous shows and the sea turtles visited regularly, at times beaching next door. I have nothing negative to say. We even stayed in one night during a rain storm and did laundry, and even that was fun! Valerie at the front desk was very helpful. The "Farmers Market" store is a block away (think organic) and the ABC store is about 5 blocks away (think....non organic large mini mart). Then there is a larger grocery store maybe 10 blocks away. It was the perfect Hawaiian experience for us. Steps to the ocean, fully equipped, exactly as pictures and described. We really loved our stay, watching whales breach from the lanai and walking distance to everything we needed in the neighbourhood. Everything was perfect, condo,people etc. The only thing we really miss is the A/C too cut the humidity. We couldn't be more pleased with our condo choice! It was just as it was described. It was our little slice of paradise - home away from home! Beautifully decorated with all the amenities we needed. 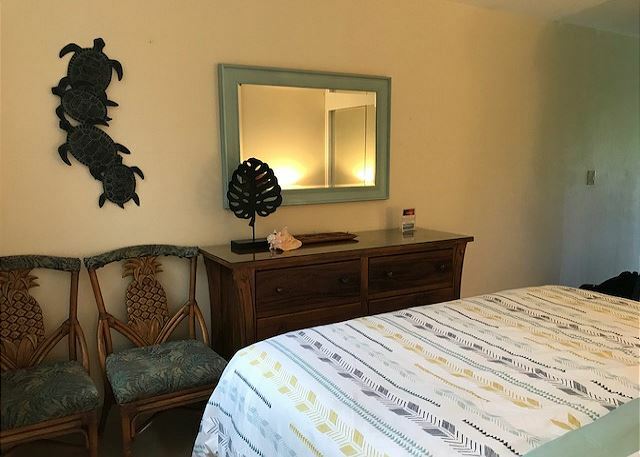 Great park with beach access within steps of the unit and yes we did see giant sea turtles right in beach area near the pool! Much nicer than staying at one of those giant condos with 100+ units. Wonderful customer service from start to finish. HIGHLY RECOMMENDED! Everything we thought it would be and MORE! a guest from Powell, Ohio does not recommend this vacation rental. Make sure you do your research. Our room #107 backed up to a very busy, loud family park that made it difficult to enjoy our stay. There was NO A/C in the unit which made it very uncomfortable most of the time. Hale Kai is not some giant, multi-story, impersonable conglomerate. 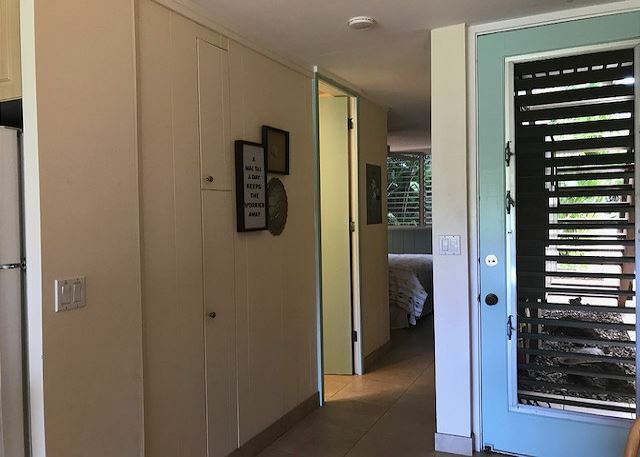 It is however, charming, small, quiet and perfectly located next to a beach park, right on the ocean and just across the street from a farmers market. The grounds are well kept and pool area tastefully located next to convenient beach access. I stay was great as always. The unit was very clean and the accommodations were great. Weather was great for the most part, but did have a few days of cooler weather and rain. Very clean and cozy one bedroom with king bed...everything we could possibly need was supplied or available...view amazing..enjoyed the turtles and whales..park next door was a bit distracting..and could sometimes hear loud neighbours around midnight...sleeping with the windows open to catch the fabulous breeze.. Recommended..
Had a great time! I extended my trip for two more days and Valerie was very accommodating in helping to make this happen! Live Aloha! Condo 107 is the place to be!!! Condo 107 at the Hale Kai is amazing and I'm very glad we stayed here for 9 nights. It certainly is a modern home by the sea and we are impressed with the decor and the most amazing views..
Definitely worth the trip and the Condo's entire feel is modern hawaiian, the Hale Kai is in a great spot across the road from a great coffee shop and down the road is the magnificent Ono Tacos and a good supermarket The Times. The title of the place was Ocean Front so we expected that and at least one photo of the unit seems to suggest it is that to me but apparently that is simply the name of the entire complex. I think that is a bit deceptive. I think your description should specify that this unit is ocean view and most of the view is that of a park. The only other issue is some traffic noise filtering down from the highway that you can hear in the bedroom. That was a little surprising but I realize there isnt much you can do about that. The unit itself was nicely appointed and the mgmt does a good job welcoming you and ensuring a clean well maintained place. I appreciated the book they had on the history, things to do, etc. as well. Wonderful experience. VERY well maintained. Could NOT have been cleaner and I'm very picky. GREAT location. Kitchen has all the tools needed to cook a nice meal. Great view of a park AND the beach where we saw lots of 100+ year old BIG sea turtles. Close enough to Lahaina to go for a nice dinner or shopping. Very quiet. Nice pool for lounging if you don't want to deal with the salt and sand. STUNNING sunsets. Other residents are very nice too. Laundry facilities in the complex. Highly recommend it. The condo was in the perfect location. Being able to see the beach and walk right out of your patio to it was wonderful. 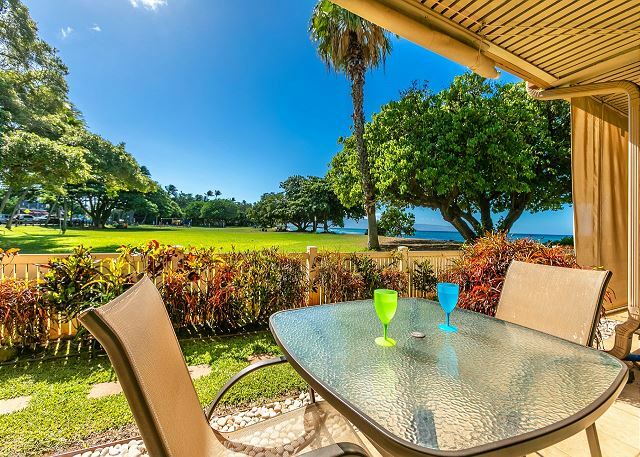 Close to many amenities... not a long drive to LaHaina and other beauty spots. Beautifully furnished condo with comfortable king size bed. Kitchen was recently redone and had all necessary amenities. Great views from the lanai. We liked the location. It was close to the beach and comfortable. The property was well stocked with amenities and we could tell there was a lot of thought put into making guests comfortable. We dud find the general cleanliness of the condo was a bit lacking, especially the kitchen and the floors. We enjoyed our stay though and would recommend this condo for reasonable price and location. We were pleased with Hale Kai 107 as always. Valerie is also an asset to the condo, helpful as always. Loved staying here! The unit was clean and well taken care of. The location is awesome! This was our 9th visit to The Hale Kai. Once again everything was absolutely perfect in everything we wanted from a vacation. Our First Trip to Maui - A little piece of Paradise & Heaven! On entering the condo after a 14 hour flight from Australia, it was absolutely breathtaking to walk in and see the ocean and beach park through the sliding glass doors. 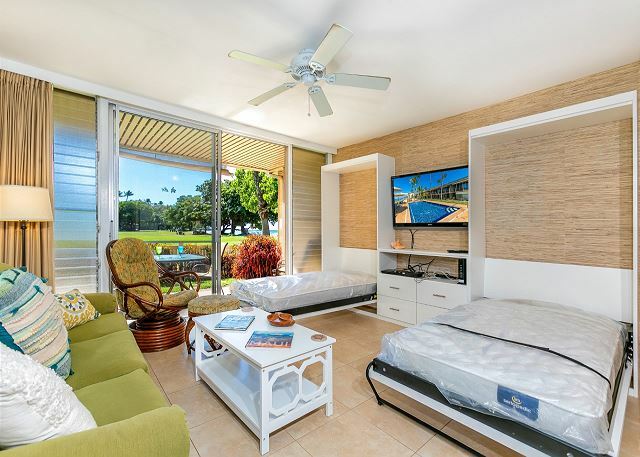 The condo was spacious, clean and had excellent quality tropical Hawaiian furnishings. No matter where you stood, in the kitchen or living area, we could always see the ocean. Being from the country, it was so relaxing to hear the sounds of the ocean with the trade winds providing cooling breezes. The Cal King bed and pillows were superb for a restful sleep. The sea turtle on the shower screen was a great theme, as they can be seen out front, in the ocean. 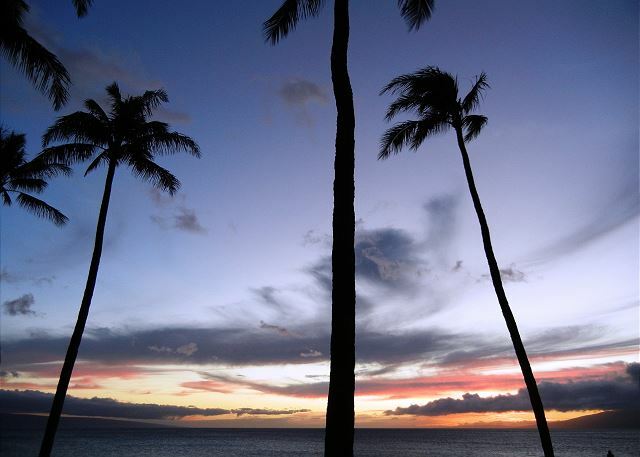 We enjoyed magnificent sunsets each night while shops and dining are within a short walk. We both loved our stay at Hale Kai and have taken away lots of beautiful memories and photos. We would recommend unit 107 to our friends and we look forward to returning one day in the future. We will definitely be returning to Hale Kai in the future. We were literally feet from the beach and the condo was exactly as pictured and described. 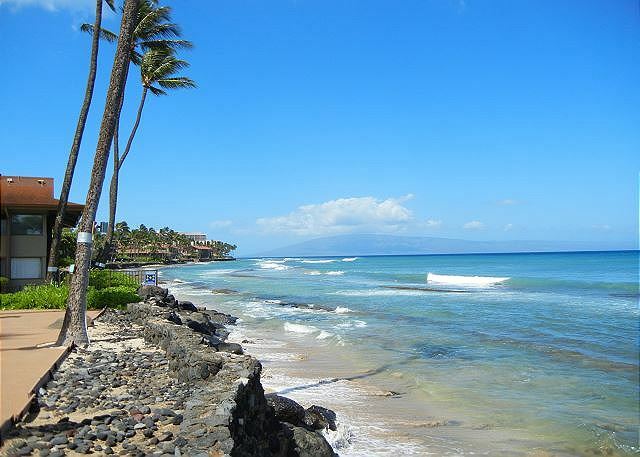 We were centrally located to all of the west shore beaches and to Lahaina for after beach activities. You can't gowrong with Hale Kai. What a great location! Having the Farmers Market and the Bad *** coffee shop across the st was perfect. Nice litttle state park next door with beach access, really nice. The condo was very nicely furnished, kitchen was super organized and well stocked with spices and all cooking essentials for my needs. Nice pool right next to the ocean with beach access. The only issue if it even is one that it can get really warm in the condo during the day without air but the nights definately make up for that. Falling asleep and waking up to the sounds of the ocean is the best!!! Besides, who needs the condo when you have Maui to explore. Thank you Hale Kai for a lovely stay, I would stay again. We loved the property and it was in the perfect was quite small and more personalised. We didn't want to stay in a resort. We could do that in our own country. Would go back there without hesitation! We had a great time staying at Hale Kai 107. The location was the best part, everything you need in walking distance, with a private beach, turtles and all! The condo was spotless and had everything we needed. Would stay here again, thanks! We have stayed in this condo for the past two years and are returning again next year. We know the owner and he is very concerned about the condition of his property and the comfort of his guests. We are very pleased with this condo. If you like being close to the ocean it can`t get any closer than this. The turtles and the open air market 3 days a week was a great experience. Our accomodation was nice and the people were freindly. I have a complaint it is that the manager could explain how to get their better. Us mainlanders do not always understand how to spell the street names. Felt very fortunate to find the place in the dark, and to go along with that the office is closed and they changed the code to the key to get into 107. She did answer the emergency number and was expecting a call but sure could have called the day before to advise me of the change. We had a wondreful time. Condo was very comfortable. 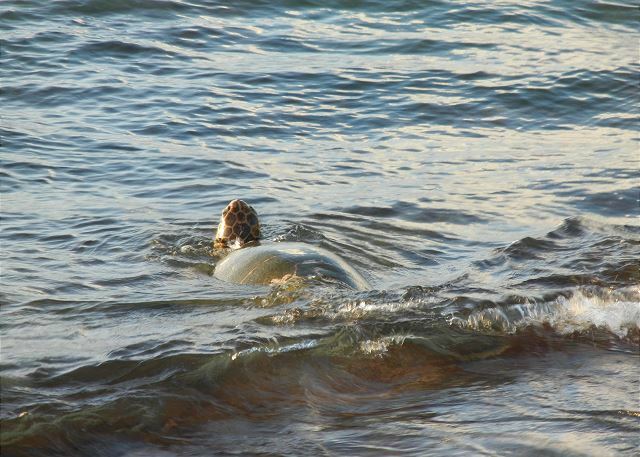 Highlight was seeing the turtles so close up just outside the condo in the sea.Great ! 5 stars. What more can I say? We really enjoyed our stay. The condo was beautiful and right on the beach. Hale Kai has its own beach or you could utilize the beach at the park that was directly next to the condo. It was very close to the market and shopping. We will be back! 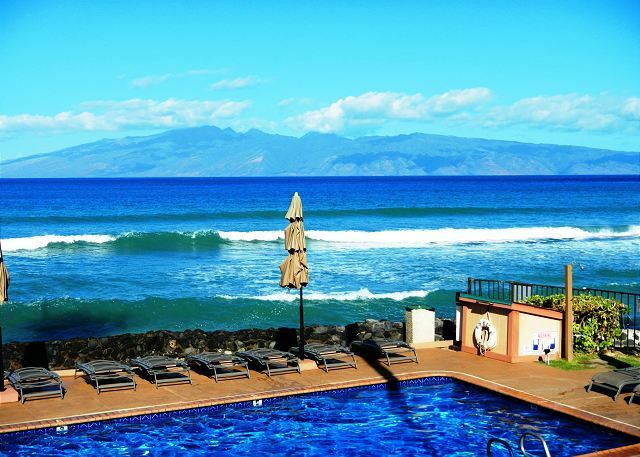 We had a great stay in Maui, we loved number 107 at Hale Kai. It is furnished and decorated in a very stylish yet homey and cosy way and had everything we needed. I wish we could have stayed longer. We saw many turtles just in front of Hale Kai condos on the beach and even got to snorkel with them. 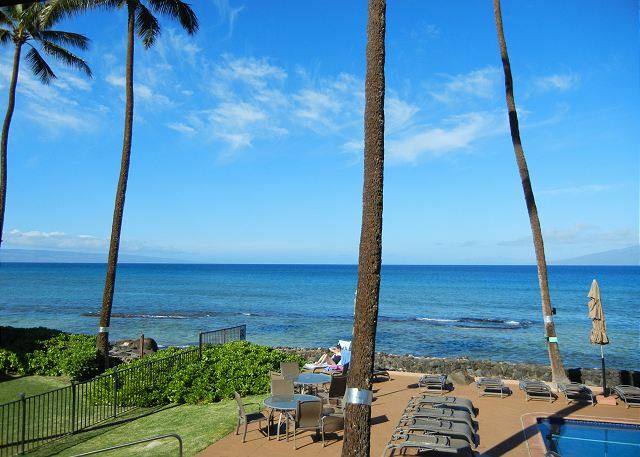 The location is convienient as it's close to Lahaina and Ka'anapili Beach which we loved! The unit was very comfortable and the maid service is the best we have ever had in Maui.